Tasteful, sensitively updated, contemporary-meets-classic. A five star haven of peace and relaxation since the 1950’s. Set in three acres, including a lovely pool area, the 137 bedroom property has a loyal following. In the heart of the diplomatic area of New Delhi with its stately, tree-lined Lutyens’s designed avenues and roundabouts. It’s a 35 minute drive from the international airport, 25 minutes from the domestic, and 10 minutes from the city centre. 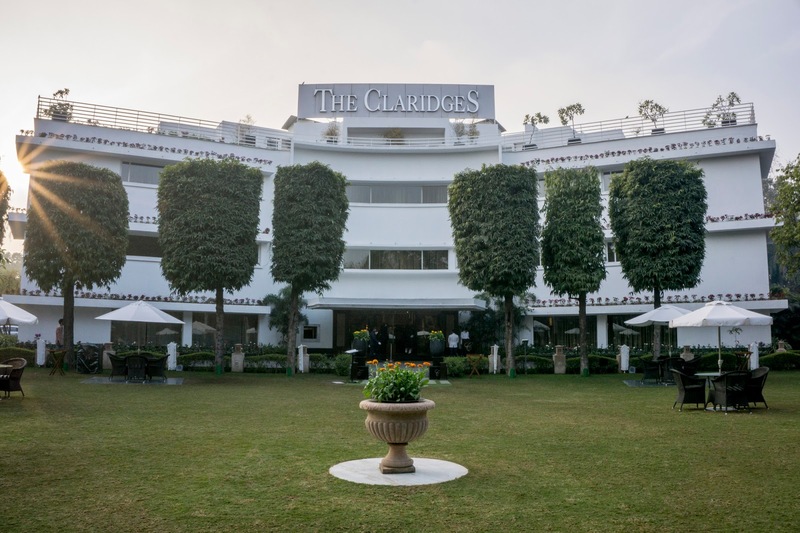 In 1950, three years after Independence, an Indian family was talked into building a hotel with a British aesthetic, and the result was The Claridges. Built in 1952, it was tasteful yet unpretentious, and is today a happy mix of old world elegance and contemporary luxury, set in a central yet quiet location. The old-fashioned charm starts in The Claridges Garden, the front lawn strewn with cane chairs, and in the lobby, with its two swing staircases. Standard rooms are medium-size, but all rooms facing the pool have either a window seat, terrace, or balcony. 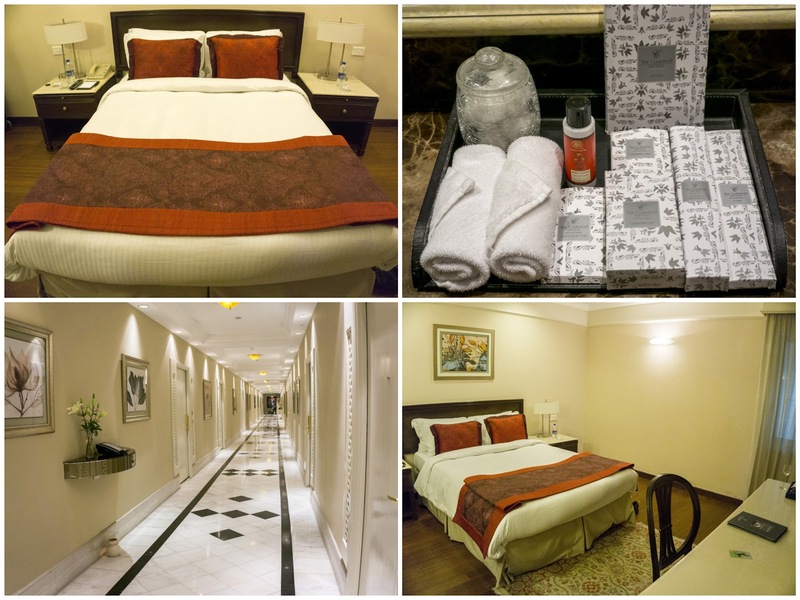 Rooms in the newer wing have plasma televisions, marble floors, and immaculately designed furnishings. The pool is temperature controlled, heated in winters, with ambient lighting, sun decks, cabanas, loungers and a bar. 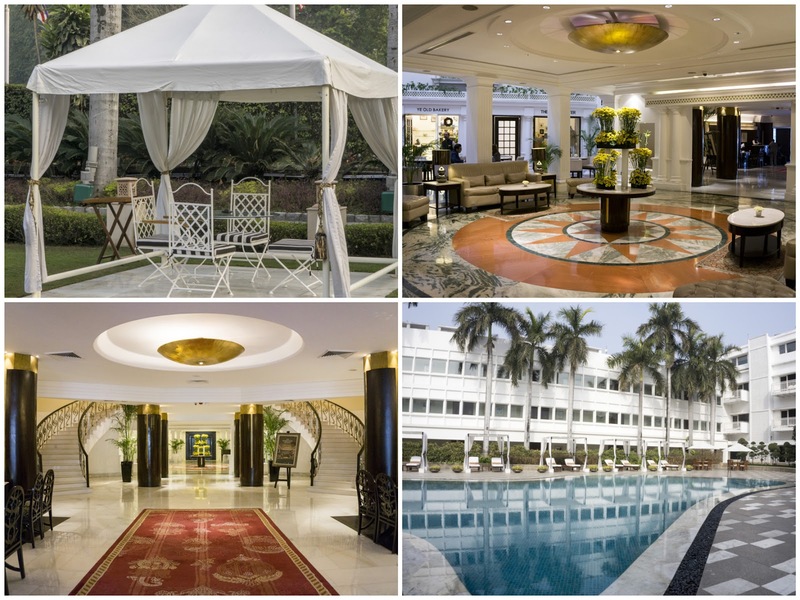 To complement its sense of peace, the hotel also has an expansive, beautifully designed and enveloping spa. The hotel has Ye Old Bakery regarded as one of the city’s oldest five star patisseries. Signature dishes are bitter chocolate cake and corn pudding, whilst also offering freshly baked breads, cookies, cakes, pastries and chocolates. The display window is a bit difficult to ignore. Also, the rooms at The Clardiges, we’re told, are amongst the most spacious in the city. And the provide jogging maps on dog tags to drape around your neck, so you don’t get lost while exercising. Clever. A healthy mix of business folk, couples, tourists from India and those from further afield. The buffet breakfast takes place in Pickwicks (with an a la carte available at lunch and dinner) and this was the first we came across in India with a good Mediterranean offering, which I duly pounced on. 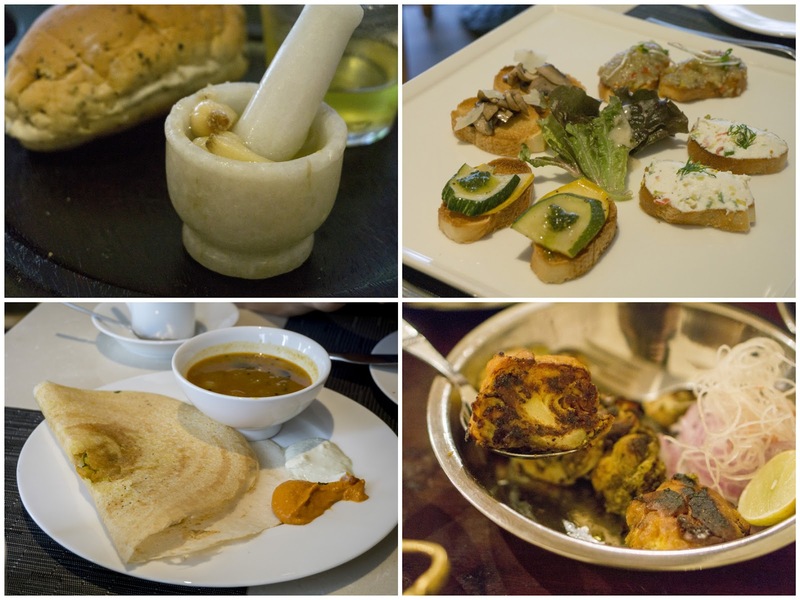 Smoked salmon, cured meats, pickles, olives, good bread, cucumber and tomatoes, cheese, eggs benedict, the ubiquitous dosa and omelette station, fruits, cereal – a good spread. I would liked to have tried their acclaimed Mediterranean restaurant Sevilla, but we only had space for lunches at the hotel, and that restaurant only opens in the evening. Regardless, Pickwicks is a good shout when you need to fill the gap between lunch and dinner and your body clock is yet to adjust to local time. 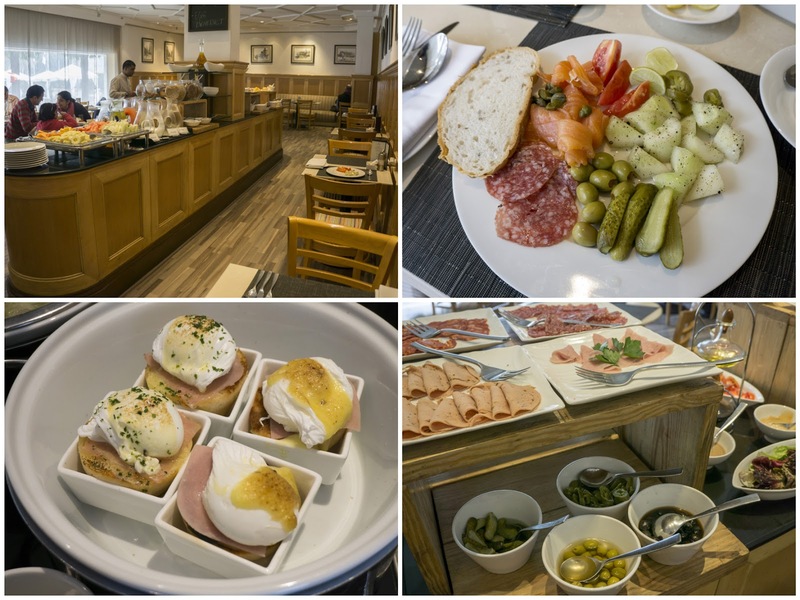 It’s open from 6am – midnight and does international cuisine rather well, for when you fancy a change. There is also Dhaba, their well-known North Indian restaurant. It aims to replicate the highway eateries (‘dhabas’) found throughout north India, popular with truck drivers. There are rustic wooden tables and chairs, natural flooring, a thatched ceiling, traditional pickle containers and an old radio playing timeless Hindi classics. 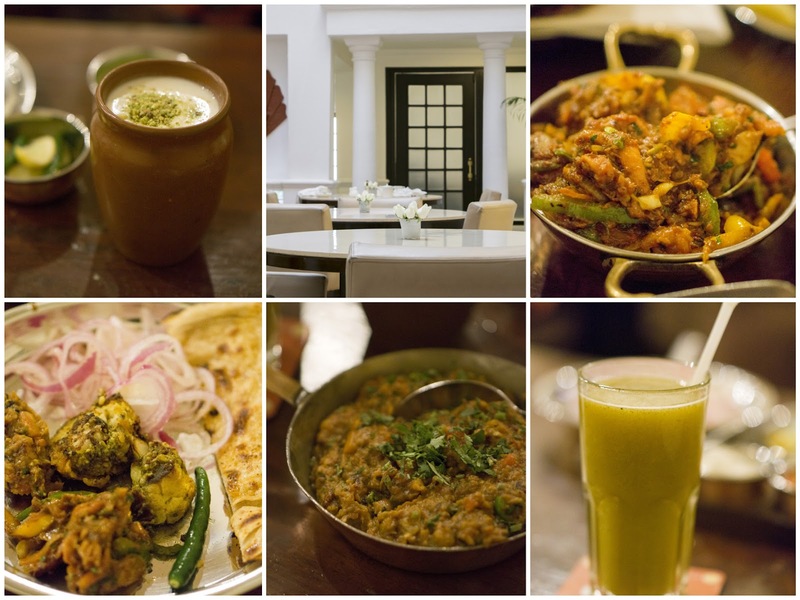 The signature dishes include tandoori kebabs, balti meat, baingan ka bharta and chef’s special thali. From what we ate, the stuffed cauliflower was particularly good. The staff were very courteous, patient and accessible, always saying hello when walking past you. They also manage to cater to every whim of what I’ve noticed can be quite demanding Indian customers. Liked lots. The lobby, exteriors and the garden are very welcoming and nicely done. Liked less. I have no doubt most of the rooms in the building are beautiful, but room 31 is not one of them. It had a small window with a latticed wall around it which let in very little light. I would advise asking for another if you get assigned this room. Also, the door didn’t create a seal, so quite a bit of light came in from the corridor at the top and bottom. I don’t know if that’s just in this case, or if that’s found in other rooms too. Prices from around £110 a night for a Deluxe room to £355 for The Claridges Suite.